College graduates are facing many doubts in terms of career development and professional success. They are afraid of competition and don’t know if their skills would be sufficient to make a breakthrough. But the situation is not so bad after all. The unemployment rate for college graduates in the US is approximately 2.5%, which is close to the historical minimum. This suggests that it’s not difficult to find a job – it’s just complicated to find a good one. 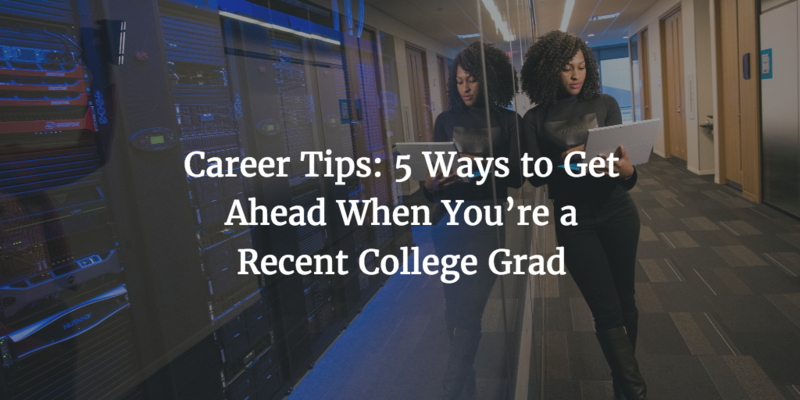 In this article, we will discuss 5 ways to get ahead when you are a recent college grad. But what are the exact moves that you should make to give you a good starting point in your career? Let’s take a look! The first tip sounds obvious but it’s necessary to keep this in mind while studying. Namely, the employment rate is much higher for those with higher levels of educational attainment. However, this is not the only perk of being a great student. Once you start working, you’ll find out that practical knowledge is not something that you can learn in school. 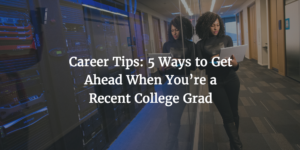 But as you move up on the career ladder, you’ll start realizing that the knowledge you gained during college helps you understand broad concepts and general processes in business. This type of balance between practical experience and theoretical understanding of your niche will eventually make you an expert. I guess that young folks are having goosebumps every time someone tells them to define their goals and values in life. But it doesn’t mean that you have to be precise about it. Simply consider the things you love and the ones you don’t. More than 2 million students will graduate from college in the US this year, which may seem terrifying for most of you here. Of course, not all of them are your competitors but still, you will face a few thousand similar profiles while looking for the first job. In such position, you may wonder what can make you stand out of the crowd. If you really want to distinguish yourself from your peers, start working as early as possible. We are not saying that need to find the full-time position during college but you should at least volunteer or try a few internships. This way, you will gain many practical experiences and also hone your communication skills. You will get used to hard work and build your self-esteem along the way, which is something that future employers can recognize easily. Many college graduates have a wrong impression that career fairs and professional orientation advisors don’t know anything about their needs and problems. But these organizations actually serve the purpose on many occasions. That is – if you are not too lazy to visit them. These services are free of charge and you can check them out anytime you want. Therefore, you should engage a little bit and see what they have to say or even offer. They can introduce you to various employment programs or even find you an employer in some cases. A lot of career opportunities come from your acquaintances. This is the reason why you should grow the professional network and meet new people from your field of interest all the time. There are two ways to do this and both are equally important. Offline networking is part of your everyday life. Socialize with people from your niche and try to establish solid relations with individuals who can help you throughout the career. On the other side, you can use many social networks as part of the online networking process. Businesspeople usually hang out on LinkedIn or Twitter but it also depends on the industry specifics. Eva Wislow is a career advisor and HR expert from Pittsburgh. She is focusing on helping people break down their limits, find a dream job and achieve life and career success. Follow Eva on Twitter.